First, make the lentil sauce. In a large saucepan, soften the onions and garlic in olive oil until fragrant. Add the herbs, and then the canned tomatoes. Once bubbling, add the red lentils + up to another cup of boiling water (use much less for a thicker, less soupy result). Bring to a simmer, add the balsamic vinegar and lots of salt and pepper, and then leave simmering for at least half an hour. Meanwhile, prepare the cabbage. Tear off whole leaves. Rinse and pat dry. In a large wok or skillet, gently heat a glug of olive oil. Throw in 4-5 cabbage leaves, with a generous sprinkling of salt and pepper. Fry for about 30 seconds, and then throw in a little white wine (about 1-2 tablespoons worth at a time). Cover, and allow the wine to steam the cabbage leaves until they have softened. You don’t want them to be fully cooked, just a little softened up, and infused with the flavor. Do this in batches until the entire head’s worth of cabbage has been prepared. Assemble your lasagna. First, pour a little lentil sauce into the bottom. Cover with one layer of cabbage leaves, and then spoon 1/2 of the remaining lentil sauce on top. Cover with another layer of cabbage leaves, and then spoon all of the ricotta cheese, and handfuls of the other cheeses on top. Cover with the final layer of cabbage leaves, and then the remaining lentil sauce. Cover with foil and bake for 25 minutes at 350F. Remove from the oven and take off the foil. 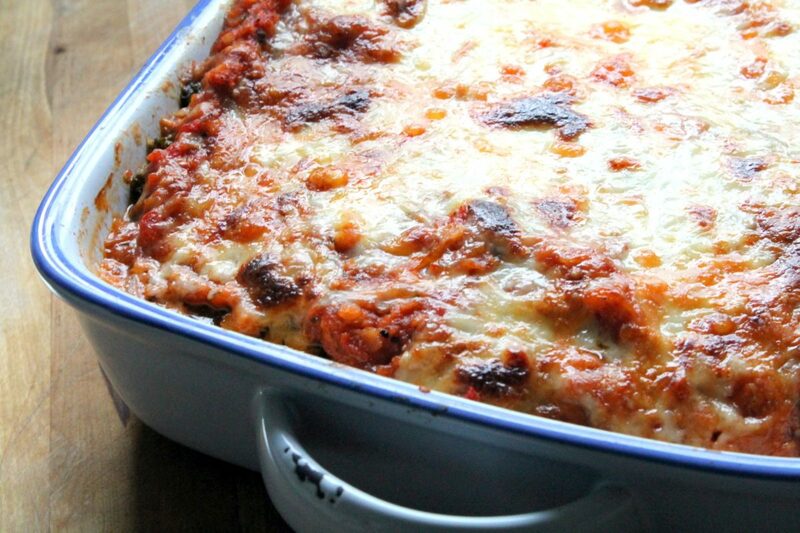 Cover the lasagne with a mix of mozzarella and grated cheddar (or whichever hard cheese you’re using). Return to the oven and cook, uncovered, for another 20 minutes. Use the grill (broiler) to brown the cheese if required. Once finished, allow to stand for about 10-15 minutes before slicing and eating.